Selfie Deaths In India: Can No-Selfie Zones, Signs And An App Protect People? : Goats and Soda India's authorities have a message to share for all takers of selfies: Stay away from wild animals, cliffs, crashing surf and monsoon floods. Is anyone listening? A man snaps a selfie in Bharuch, India. How far would you go to snap the perfect selfie? For some people, the answer is clearly: too far. In July, a 28-year-old man sneaked into a restricted safari area at the Bannerghatta Biological Park in Bengaluru with his friends. He held his camera up to get a photo of himself with an elephant. The animal trampled him to death. That same month, four people were trying to take a selfie on a cliff at Nagoa Beach. As waves crashed into the cliff, they fell in the Arabian Sea and were swept away. All of them drowned. India's authorities are out to quash risky selfies, joining other countries like Russia (which has created signs and campaigns to promote safe selfie-taking) and Spain (which has banned people from taking selfies during the annual running of the bulls). The Mumbai police has identified 16 accident-prone zones in the city where selfie-related deaths were rising. They are trying to raise awareness about the risks of selfies at places like Mumbai's iconic seafront at Marine Drive and the popular Girgaum Chowpatty Beach. The campaign was created in the wake of a selfie-related accident in January 2016, when three young women slipped while taking a selfie and fell into the water in Bandra, a beachfront neighborhood in Mumbai. A passer-by saved two of them; the third drowned — and their rescuer is also believed to have drowned. And in June the mobile giant Samsung sponsored a YouTube video in which Nitin Gadkari, India's minister for shipping, road transport and highways, urges people to use their mobile phones responsibly. These dire selfie warnings come on the heels of a study published last year: Me, Myself and My Killfie. The title of the report uses the word "killfie" to describe selfies taken under circumstances dangerous enough to kill you. To find these "killfies," researchers from Carnegie Mellon University and the Indraprastha Institute of Information Technology (IIIT) in New Delhi rounded up newspaper reports and data on selfie deaths worldwide. Because the study relies on media accounts, it's not a definitive tally of deaths by selfie worldwide. 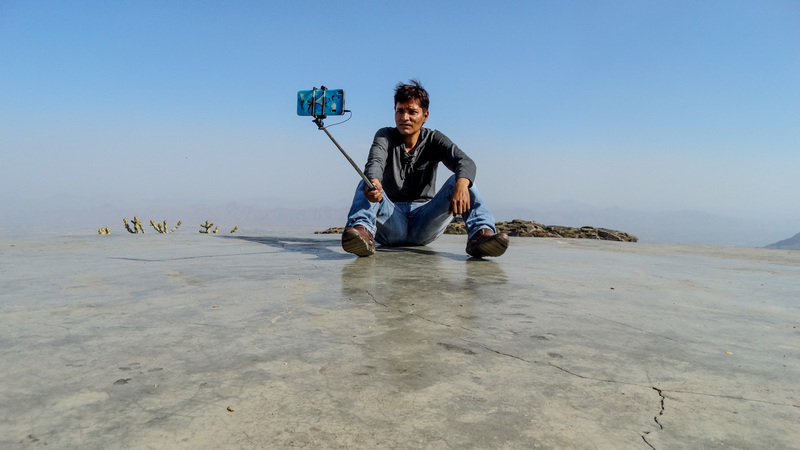 "There is very little empirical data [on selfie-related deaths] at the moment," says Rajendran Narayanan, a social scientist based in Trichy, India, and former dean of arts at Bharathidasan University who did not work on the report. 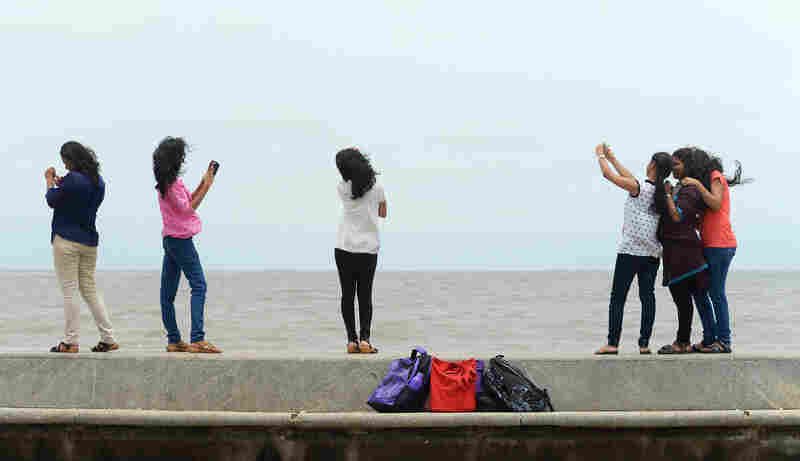 In this photograph taken on June 15, 2015, young Indian students take 'selfies' on Marine Drive promenade in Mumbai. The results of the study, however, are indicative of a larger trend, he notes. "While the act of taking a selfie in itself isn't harmful or dangerous, taking a selfie in a dangerous location is," he says. "As a society, we need to be aware of this." The research team found accounts of 127 reported deaths by selfie between 2014 to 2016, with more than half in India. Among the causes of death: taking selfies with wild animals, on railway tracks and in moving vehicles. Deaths caused by taking a selfie with a gun were reported in the U.S. and Russia but did not appear to be an Indian phenomenon. The researchers didn't just want to keep count of selfie deaths. They wanted to create a tool to identify hazardous areas for selfie-taking. The app sends users a text message when they are near a location that poses a threat to selfie-takers. Users will also be notified if they are at the locations where the 127 selfie deaths from the the study occurred. The developers hope that users can build on its resources. Anyone with access to the app can contribute. If three people mark a location as risky, the app will add it to the list of danger spots. This system helps safeguard the app from pranksters. Ultimately, the researchers just want people to be safe when taking a selfie. Perhaps the Mumbai police said it best. Just before this year's monsoon season in June, they warned people not to take selfies in the heavy rains. They wrote on Twitter: "Don't make 'taking a selfie' mean 'taking your own life.' "